Clercy Prejean was co-owner of Landry’s Clothing Store from 1963 to 1988. He worked in the retail business for over 43 years. 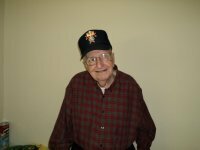 Prejean has been a resident of Eastridge Nursing home since 2011. Prejean was the Resident Council President of Eastridge for 2012 and 2013. In 2012, he was crowned King of Eastridge. He was also crowed King of the Louisiana Nursing Home Association (LNHA) Region III and crowned the 2012 Louisiana Nursing Home Association (LNHA) King of State. Prejean is a member of the Knights of Columbus (President of Grand Knight 3rd/4th Degree), Lions Club Board Member, and is the president of an auction that raises money for the Vermilion Association for Handicapped Individuals. He is still very active in the cultural affairs for the area. Prejean had his own band for 16 years, “Clercy & The Rhythm Boys”. He still enjoys entertaining at the nursing home. He was married to the late Irene Broussard Prejean.